August 27, 2008: The single largest day for this blog in terms of hits, reads and minutes on site. I needed to take a little pause, a deep breath before writing anything of a personal nature. I think that I am somehow, uniquely positioned to add insight and reflection regarding the purchase by Ricoh of IKON. First, an introduction: Today is August 27th, 2008 I just pulled up my resignation letter to IKON dated October 10, 2007 – it hasn’t even been a year. At that time, I knew I had left 8 months too late. The very next day, I felt relief. I will not go into all the reasons why I left – after nearly 4 years, it just wasn’t working out. But while I was there, I met and worked with some of the most professional, caring and empathetic people in the industry. And while I was there, I worked with some of the most foolish, idiotic, numb-skulled people you would ever meet. Worse, were some of the most “over the top” procedural rules and protocols imaginable. For every sale, at least 35 “support” people needed to touch the order in some manner. For one order of mine, I tracked 62 people on one email string. We are talking a bureaucracy that rivals the Mexican or any other third world government. While with IKON, I learned more about document management, software, and business. 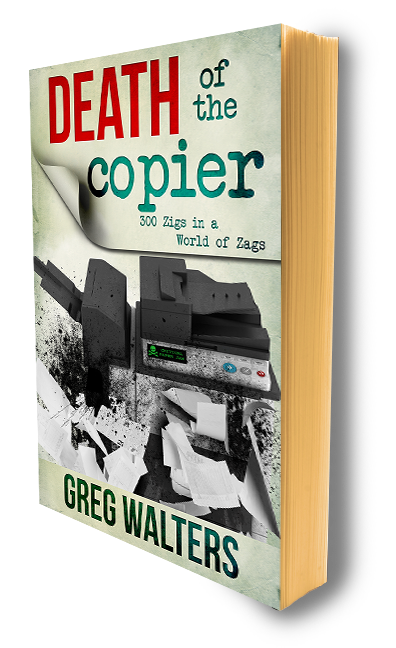 I enhanced my existing knowledge of how copiers and printers and software impact the business. I was given the freedom to learn all I could about each and every machine or delve into the most complex Document Management Software. I carry not one ill feeling towards the company, and I have fond memories around the people I met and worked with there in Redlands. Don, Mike, Dawn, Karen, Katie, Monica, Nicole, Kim, Doug, Mark and all the rest…good times. Also, I met some exceptional people from Ricoh. The Ricoh/IKON relationship was a great one, at least in SoCali, I can’t comment on anywhere else. You see, most of IKON’s business was Canon so Ricoh was always “second” – and they seemed to try a bit harder than anyone else. Ricoh spent money on IKON. Contests/Trips to Vegas, golf outings, dinners, client events – with Ricoh the answer was always, “yes, do you need more?” I do remember those times – Jerry and Frank. Ricoh Americas Corporation was established in 1961, boasts revenues of 2.8 billion yearly and utilizes Ricoh Business Solutions as the direct sales arm of Ricoh. IKON had three basic “entities” - Hardware, Managed Services and Professional Services. Seriously, the main reason RBS ever won deals over IKON was price. An RBS Sales Rep didn’t have a 15% “pack” lobbed on by corporate IKON. A channel of over 400 locations in North America and Europe, 24,000 employees, nearly 10,000 trained and certified technicians; certified on HP, Kyocera, Konica Minolta, Ricoh AND Canon. Ricoh, will have a remanufacturing plant down in Mexico. Ricoh just acquired a portfolio of On-Site Managed Services Clients. Lots with Canon gear. Ricoh sliced away from Canon a additional, friendly supplies infrastructure on a Global scale. But the big Gem in the deal is IKON's Professional Services team. These folks are highly trained in the art of software (relative to the industry). No other company has so many people trained and experienced in selling and implementing multiple document management software systems. I mean, in the software realm, Xerox has Xerox specialists who only know and install Xerox - HP has external "partners", Konica Minolta has very little and is growing in this area. No other company has committed so much to so many different software partners. And when you look at what IKON has next to what RBS did not have, the difference is striking. IKON is more robust then RBS. And although Ricoh is plunking down the cash, the infrastructure, the value system and the sheer girth of IKON could overtake RBS in a heartbeat. This dwarfs any and all previous acquisitions even the Xerox/Global “merger” and makes the Konica-Minolta-Danka deal look like folly. Indeed, this time next year, the IKON infrastructure may have completely engulfed RBS to such a level, that RBS exists in name only. Make no mistake - this is a purchase, not a merger. Oh, and for current IKON employees, there could be a very silver lining. Ricoh isn’t “rescuing” IKON. Aside from reducing management, and completing the implementing some internal software, IKON will not need to change all that much – the question is, can Ricoh handle this assimilation or will they develop a bad case of heartburn. In 3 months, Ricoh will have the biggest and most trained selling force in the industry. And the transition for sales people could be the least painful of all. What about the IKON employees? As far as I am concerned, there is plenty to cut in the mid to upper management levels – but for Ricoh, the on the street, in the trenches, sales force is better trained then any out there and CAN be highly motivated when given proper vision and management. So, the selling staff has a great opportunity to lead the success of the amalgamation – if Ricoh is as smart as I think they are, they won’t get rid of too many sales people. And as an IKON sales person, one day you will be competing head to head with…Canon. And who knows Canon better than an IKON rep? Richard Berger, a spokesman in Tokyo for Canon, declined to comment on whether the company was in talks to buy Ikon or would submit a bid. ``We plan to accelerate our strategies that enhance our commitment to independent distributors,'' Berger said." More likely, these new Ricoh Sales people will be going up against a small, independent, newly christened Canon dealer. The poor fellow won’t know what hit him. And anyone who upset Ricoh in the last 5 years by converting a Ricoh prospect into a Canon sale. Very good thoughts, Greg. This is all the buzz, and will make for some very interesting opportunities for us as both RBS and IKON are a little preoccupied with the merger talks. Make no mistake, IKON has a potent selling and PS force - we take nothing away from them on that front. Needless to say - for the first time in our history, a Canon rep actually called us to inquire as to whether we were a prospect... This is all very interesting, and I will enjoy watching this play out. Excellent insight! As a current Ikon employee in PS, I am somewhat excited about this merger. However, having been with Ikon (and the preceding acquired company) for 20 years, I'll remain cautiously optimistic until I see how this really falls out. But, after reading your blog, I feel a bit better about this. Hearing some of the things my management are saying coming from outside the company (even if you were an Ikonian less than a year ago) is encouraging. But PS folks I know are in a good position - even if Ricoh "spins" the PS division off, you folks should be ok.
And I doubt Ricoh would do that. Well, I think Ricoh is taking a big gamble. A $1.6 billion gamble. I too used to work for Ikon, but on the service side. In my area Ikon used to have 8 sales reps and 20 techs, today they have 3 sales reps and 10 techs. The Mom and Pop dealers are beating up on them pretty bad. Everything Ikon does is SLOW and usually not done properly the first time. Any manager that was any good or had an original thought either left on their own or were forced out years ago. The managers left at Ikon are only "yes" men. Ricoh's success will depend on how they can get true leadership into Ikon's management team and cut red tape. I'm more interested in what Canon is going to do. They just lost Danka as a distributor and now will lose Ikon. Canon will be left holding an empty bag. There is nobody left for them to buy, so their only option is to expand with new dealers. Sounds like a big task, but then again they didn't spend $1.6 billion. It will definitely be interesting to see what the future holds for the copier industry. I wonder if you were one of those 'good managers that had original thoughts'that was 'forced out'? Errrr...no, I wasn't one of the "good managers"...as a matter of fact, I think the best manager is STILL employed with RiKON - in Redlands, CA. I learned a lot from that guy, stuff that has little to do with Ikon.